Background: Perilesional gliosis is an important substrate for seizures in patients harboring a calcified neurocysticercosis (NCC) lesion and magnetic resonance imaging (MRI) is useful for evaluating gliosis. Aims: The purpose of this study was to evaluate the usefulness of double-inversion recovery (DIR) sequence for identifying perilesional gliosis. Settings and Design: Hospital-based cross-sectional study. Methods and Materials: Forty-five patients with seizures were included in this study and a total of 88 calcified lesions identified on susceptibility weighted imaging (SWI) were evaluated on 3D-fluid attenuating inversion recovery (FLAIR), 3D-DIR, and 3D-postcontrast T1-weighted imaging on a 3T MRI for the presence of perilesional signal changes/enhancement. Perilesional signal was rated on a semiquantitative scale from grade 0 to 2 by independent raters. Statistical Analysis Used: Friedman, Wilcoxon signed rank, and Kappa tests were used. 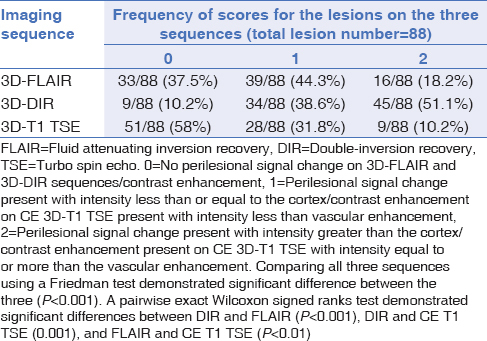 Results: 3D-DIR sequence performed better than both 3D-FLAIR and postcontrast 3D-T1W sequences as more number of lesions showed perilesional signal change on DIR sequence. DIR sequence showed perilesional signal abnormality in 24 lesions in which 3D-FLAIR was normal, whereas in another 18 lesions, it demonstrated perilesional signal changes better than 3D-FLAIR. In only three lesions, FLAIR was found to be superior to DIR sequence, whereas postcontrast T1W images showed rim enhancement in five cases where no perilesional signal change was seen on FLAIR/DIR sequences. Conclusions: Combining 3D-DIR with 3D-FLAIR, and postcontrast 3D-T1W sequences is beneficial for evaluation of calcified NCC lesions and 3D-DIR sequence is better than other two sequences for perilesional signal abnormalities. Key Message: The double-inversion recovery (DIR) MRI sequence, when incorporated into the protocol for evaluation of calcifed neurocysticercosis, along with FLAIR, SWI, and postcontrast T1-weighted imaging, detects perilesional gliosis in many calcifed lesions, which may be responsible for the resistant epilepsy that the patient may be having. In this pilot retrospective study, we evaluated isotropic 3D-DIR along with 3D-FLAIR and postcontrast 3D fat suppressed T1 imaging to compare its performance over the other two conventionally used sequences in detecting presumed perilesional inflammatory gliosis in the calcified cysticercous brain lesions in patients who presented with focal seizures. Henceforth, in the manuscript, this entity will be referred to as presumed perilesional gliosis (PPG). In total, 45 patients presenting to us with seizures and showing calcified lesion (s) on MRI were included in this study. There were 26 males and 19 females with their age varying from 18 to 51 years. In addition, we also included ten subjects with a calcified lesion with no seizure as controls to look for any evidence of perilesional gliosis. Besides MRI, all these patients underwent a detailed clinical evaluation, routine investigations, and electroencephalogram (EEG) to evaluate the focus of seizures. Local ethics committee approval was taken for this study. The imaging protocol [Table 1] included T2, T1, susceptibility weighted imaging (SWI), DWI, balanced turbo field echo (bTFE) axial, 3D-FLAIR, 3D-DIR, and 3D-postcontrast fat-suppressed T1-weighted imaging on a 3T MRI (Achieva/Inginia, Philips Health care, Best, the Netherland). Calcification was confirmed by SWI showing susceptibility and positive phase on phase imaging. The scolex could be demonstrated in most of the lesions on imaging. These two criteria were used to confirm the diagnosis of calcified NCC in these patients. The data were blindly analyzed by two neuroradiologists, one with more than 10-year experience and other with more than 5-year experience. At the time of review of images, default window settings were used and initially lesions were identified on SWI images. Corresponding areas were observed in FLAIR, DIR, and postcontrast T1W 3D-turbo spin echo (TSE) images simultaneously to identify the PPG in inversion recovery images and enhancement on post contrast T1W images. The PPG on DIR and FLAIR images were evaluated on a semiquantitative scale ranging from 0 = no perilesional signal change, 1 = perilesional hyperintensity identified images which are either isointense or hypointense to the adjacent gray matter, to 2 = perilesional hyperintensity which is hyperintense as compared with the adjacent cortex. Similarly, on postcontrast T1W images, enhancement was graded as 0 = no enhancement around the calcified lesion, 1 = enhancement present but its intensity was less than the enhancing vascular structure, and 2 = enhancement present which was intense and appeared isointense or hyperintense to the nearby enhancing vasculature. Overall, 0 was indicative of absence of PPG, and on postcontrast study, lack of enhancement suggested that lack of inflammation induced blood–brain barrier breakdown. A score of 1 suggested the presence of PPG which was less conspicuous, whereas a score of 2 indicated PPG which was conspicuous and easily identifiable. On postcontrast study, enhancement was indicative of blood–brain barrier breakdown which was less evident if the score was 1, whereas the score of 2 indicated more obvious abnormality and an improved lesion conspicuity. 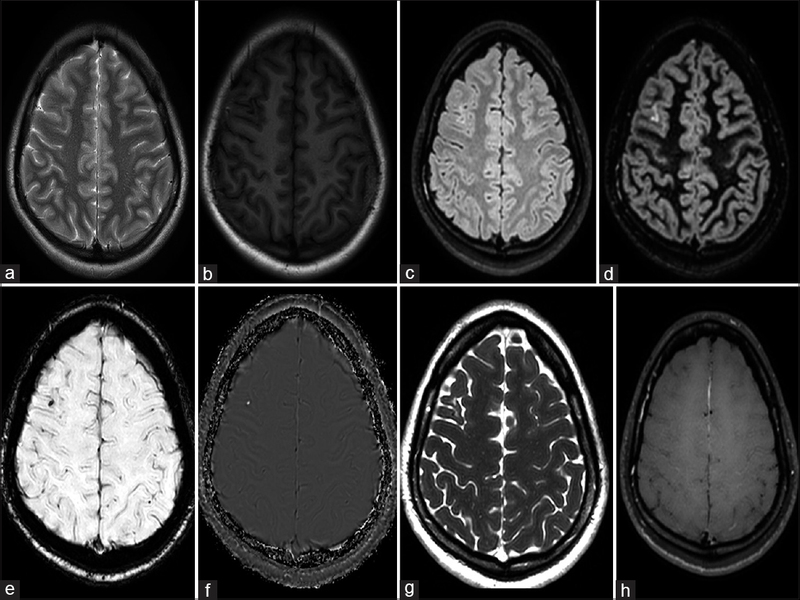 Another 10 patients who underwent MRI study due to other neurological conditions, such as headache, demyelination, etc., and had an incidentally noted calcified granuloma in the brain were also analyzed. These patients had no history of seizures. The data were represented as median and interquartile range. Due to ordinal scale of data, nonparametric Friedman's test was used to observe differences among the three modalities. Wilcoxon signed rank test was used to observe the paired difference between the modalities. Kappa test was conducted for observing concordance of observations between two observers. P value <0.05 is taken as significance level for Friedman's test. Inter-rater agreement was evaluated using Cohen's kappa statistics for each study sequence, and graded as poor (<0.0), slight (0.00–0.20), fair (0.21–0.40), moderate (0.41–0.60), substantial (0.61–0.80), and almost perfect (0.81–1.00), based on the paradigm proposed by Landis and Koch for categorical data. For determination of clinical concordance, conflicting interpretations of all lesion types were mitigated through consensus when necessary. Consensus interpretation was agreed upon regarding the presence of an abnormality and its location. In total, 88 lesions were analyzed in 45 patients' data. Clinical records were reviewed for demographic data, presence of seizures, seizure type, other clinical features, and electrophysiology information. Clinically, 10 patients had focal seizures, 4 patients had multiple seizure types, whereas remaining had generalized seizures or focal seizures with secondary generalization. Seizure frequency ranged between 1 per year and 3–4 per month with the mean number of seizures being 1.11 ± 0.4 per month based on the last 1 year duration. Symptom duration ranged from 1 month to 4 years. On imaging, a single lesion was noted in 37 patients, whereas remaining had multiple lesions. In total, 45 lesions were seen in the frontal lobe, 14 in the parietal lobe, and 11 each in the occipital and temporal lobes. Remaining seven lesions were seen in deep gray matter structures or the cerebellum, and all these were noted in patients with multiple lesions. There were four lesions that did not show any PPG on either FLAIR or DIR sequence and did not show any enhancement on postcontrast study and all these lesions were in the deep gray matter or the cerebellum. Twenty-three lesions showed PPG or enhancement on at least one of the three sequences. In 35 lesions, perilesional abnormality was detected on two sequences, whereas the remaining 26 lesions showed perilesional signal abnormality on all the sequences. Significant differences in the detection of PPG was noted between 3D-FLAIR and 3D-DIR sequences (P < 0.001). 3D-DIR sequence performed better than postcontrast 3D-T1W sequence as well and more lesions were detected with increased lesion conspicuity on 3D-DIR images (P < 0.001). On comparing FLAIR and DIR images, it was noted that 43 lesions were graded equally on both the sequences, whereas 33 lesions on 3D-FLAIR failed to show any PPG, of which 24 were found to be positive on DIR images [Figure 1] and [Table 2]. In 18 lesions, DIR showed a higher grade of PPG as compared with the FLAIR images suggestive of an increased lesion conspicuity [Figure 2]. In three lesions, PPG was visualized better on FLAIR images. All 10 subjects with calcification and no seizures were taken as seizure-negative controls, and did not show any PPG or abnormal enhancement on postcontrast study. On comparing DIR and postcontrast T1W images, it was noted that DIR could identify PPG in 47 lesions, which showed no enhancement on post contrast T1W images. However, five lesions of the total nine lesions, which showed no PPG were found to be showing ring enhancement on contrast study and were hence more conspicuous [Figure 3]. The interobserver agreements measured by a Cohen's kappa value were 0.76 for 3D-CE T1-TSE, 0.77 for 3D-FLAIR, and 0.93 for 3D DIR sequence [Table 3]. The 3D-DIR images showed the highest interobserver agreement of 0.93, which is a very good agreement. The 3D-FLAIR and postcontrast T1 TSE showed the kappa value of 0.77 and 0.76, respectively, suggestive of substantial agreement. None of the patients with an incidentally detected calcified granuloma showed any PPG on 3D FLAIR or DIR sequences. 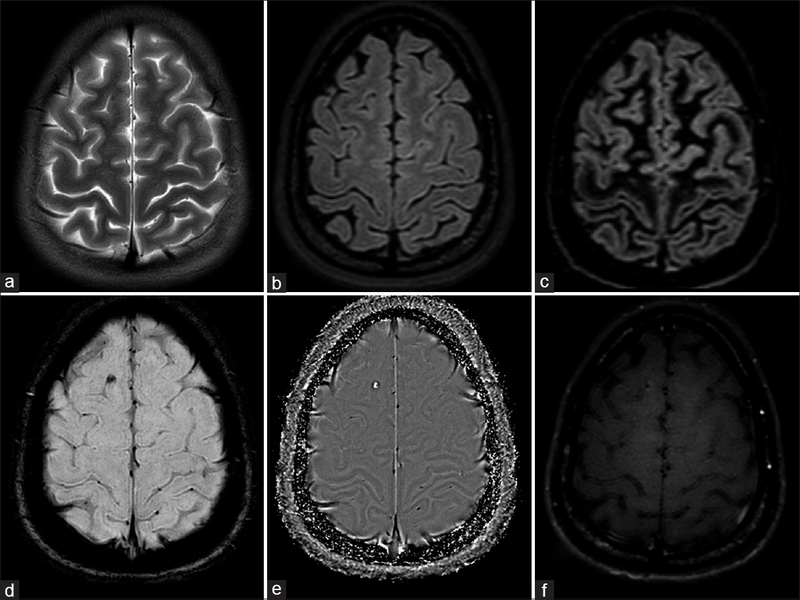 On comparing the clinical localization of seizures in 10 patients who had focal seizures and the side of calcification on MRI, clinicoradiological concordance was noted in the 8 patients. Of these eight patients, two had multiple lesions, and in these two patients, concordance was noted between the clinical localization and the side of lesion with PPG. In this pilot study, DIR imaging showed perilesional signal abnormalities possibly due to inflammation and gliosis in significantly more number of lesions which were not visible on FLAIR imaging or did not enhance on postcontrast study. However, few lesions were more conspicuous on FLAIR than DIR and showed significantly more PPG around the calcified lesions even when these did not enhance or minimally enhanced on postcontrast study. DIR imaging has been primarily utilized in detecting the cortical/juxtacortical lesions in multiple sclerosis, and in defining the cortical abnormalities in resistant epilepsy where the conventional MRI may be normal in localization.,, It has also been used in conjunction with conventional imaging sequences to improve the sensitivity of detection of hippocampal sclerosis in patients with temporal lobe epilepsy. We could detect the PPG in a significantly large number of calcified lesions using 3D-DIR sequence, which was not visualized on 3D-FLAIR imaging as well as did not show any obvious breakdown in blood brain–barrier resulting in postcontrast enhancement of the lesions. Previous studies have shown that presence of perilesional gliosis in calcified granulomas is associated with a higher incidence of seizures., Possible mechanism suggested for seizures is the presence of subclinical inflammation in the calcified lesions which exacerbates episodically leading to the perilesional edema. This hypothesis is supported by the results of DCE perfusion MRI, where it was noted that some of the calcified lesions showed increased blood brain barrier permeability, despite the absence of obvious perilesional edema or obvious contrast enhancement. In the study from Rathore et al., evidence of chronic inflammation and gliosis was reported around the calcified granulomas, which were removed as part of the surgical treatment for refractory epilepsy, to confirm that perilesional gliosis in calcified NCC is associated with refractory seizures. Various MR sequences have been used in the past to define the perilesional inflammatory gliosis. T2, FLAIR, and T1 MT have been reported to be useful for depiction of perilesional signal alterations, whereas postcontrast imaging is commonly used in the identification of inflammation and blood–brain barrier disruption around these calcified granulomas.,,, In our study, we could clearly demonstrate the improved detection of PPG on DIR as compared with the other conventional MR sequences. Quantification of blood–brain barrier using DCE MRI is a useful adjunct to identify perilesional inflammation; however, it needs dedicated software for its quantification. DIR sequence is available on all the scanners and can be used as a part of the routine imaging protocol for evaluation of calcified granulomas. Our results suggest that 3D-DIR is useful in detection of PPG, which is known to be associated with seizures recurrence in these patients  and thus may help in treatment-related decision making. Lack of surgical confirmation of the DIR abnormality may be considered a major limitation of this study. The histological confirmation is only possible in cases where surgery is done in patients having a refractory epilepsy, which has been reported to be in <1% in patients with NCC. In this study, the primary aim was to identify perilesional inflammation with gliosis, which could be clearly seen better on DIR when compared with FLAIR sequence. We did not have a large control arm in this study where asymptomatic subjects with a calcified granuloma were imaged using DIR sequence to look for the incidence of PPG and this may be considered a limitation of this study. However, 10 patients with incidental calcified lesions did not show perilesional signal abnormalities on any of the three sequences. We hypothesize that the incidence of perilesional gliosis identified using DIR would be significantly higher in patients with recurrent seizures and similar observations were made in a previous MT-based study. Calcification of cyst is not associated with presence or recurrence of seizures and factors like perilesional changes play an important role. However, based on this study, we cannot establish the relationship between DIR identified abnormality and symptomatic seizures and it requires future studies with a control arm as well as a detailed clinical and electrophysiological correlation. DIR should be added to the protocol for evaluation of calcified NCC along with FLAIR, SWI, and postcontrast T1-weighted imaging, as it detects perilesional gliosis in many calcified lesions, which may have bearing on resistant epilepsy and management strategies in these cases. Garcia HH, Del Brutto OH, Cysticercosis Working Group in Peru. Neurocysticercosis: Updated concepts about an old disease. Lancet Neurol 2005;4:653-61. Singh G, Burneo JG, Sander JW. From seizures to epilepsy and its substrates: Neurocysticercosis. Epilepsia 2013;54:783-92. Nash TE, Bustos JA, Garcia HH. Disease centered around calcified taenia solium granuloma. Trends Parasitol 2017;33:65-73. Prasad A, Gupta RK, Pradhan S, Tripathi M, Pandey CM, Prasad KN. What triggers seizures in neurocysticercosis? A MRI-based study in pig farming community from a district of North India. Parasitol Int 2008;57:166-71. Thomas CB, Brown CR, Wijemanne S, Quezado M, Nash TE, Ooi WW. A calcified taenia solium granuloma associated with recurrent perilesional edema causing refractory seizures: Histopathological features. Am J Trop Med Hyg 2011;85:460-3. Nash TE, Del Brutto OH, Butman JA, Corona T, Delgado-Escueta A, Duron RM, et al. Calcific neurocysticercosis and epileptogenesis. Neurology 2004;62:1934-8. Pradhan S, Kathuria MK, Gupta RK. Perilesional gliosis and seizure outcome: A study based on magnetization transfer magnetic resonance imaging in patients with neurocysticercosis. Ann Neurol 2000;48:181-7.
de Souza A, Nalini A, Kovoor JME, Yeshraj G, Siddalingaiah HS, Thennarasu K. Perilesional gliosis around solitary cerebral parenchymal cysticerci and long-term seizure outcome: A prospective study using serial magnetization transfer imaging: Perilesional Gliosis and Seizures in Neurocysticercosis. Epilepsia 2011;52:1918-27. Gupta RK, Awasthi R, Rathore RK, Verma A, Sahoo P, Paliwal VK, et al. Understanding epileptogenesis in calcified neurocysticercosis with perfusion MRI. Neurology 2012;78:618-25. Kolber P, Montag S, Fleischer V, Luessi F, Wilting J, Gawehn J, et al. 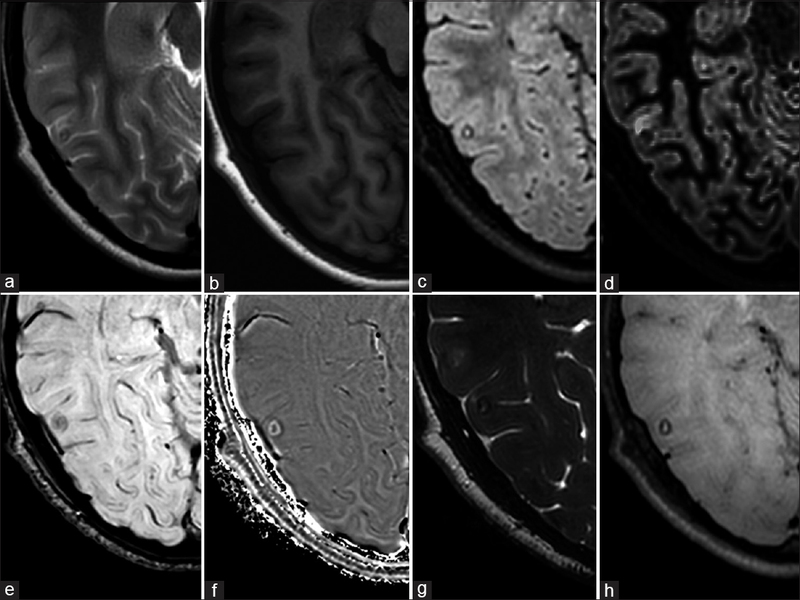 Identification of cortical lesions using DIR and FLAIR in early stages of multiple sclerosis. J. Neurol 2015;262:1473-82. Wychowski T, Hussain A, Tivarus ME, Birbeck GL, Berg MJ, Potchen M. Qualitative analysis of double inversion recovery MRI in drug-resistant epilepsy. Epilepsy Res 2016;127:195-9. Wong-Kisiel LC, Britton JW, Witte RJ, Kelly-Williams KM, Kotsenas AL, Krecke KN, et al. Double inversion recovery magnetic resonance imaging in identifying focal cortical dysplasia. Pediatr Neurol 2016;61:87-93. Roy B, Verma S, Awasthi R, Rathore RK, Venkatesan R, Yoganathan SA, et al. Correlation of phase values with CT Hounsfield and R2* values in calcified neurocysticercosis. J Magn Reson Imaging 2011;34:1060-4. Verma A, Awasthi R, Prasad KN, Soni N, Singh K, Paliwal VK, et al. Improved detection of parenchymal cysticercal lesions in neurocysticercosis with T2*-weighted angiography magnetic resonance imaging. Acad Radiol 2012;19:958-64. Landis JR, Koch GG. The measurement of observer agreement for categorical data. Biometrics 1977;33:159-74. Nelson F, Poonawalla A, Datta S, Wolinsky J, Narayana P. Is 3D MPRAGE better than the combination DIR/PSIR for cortical lesion detection at 3T MRI? Mult Scler Relat Disord 2014;3:253-7. Li Q, Zhang Q, Sun H, Zhang Y, Bai R. Double inversion recovery magnetic resonance imaging at 3 T: Diagnostic value in hippocampal sclerosis. J Comput Assist Tomogr 2011;35:290-3. Rathore C, Thomas B, Kesavadas C, Abraham M, Radhakrishnan K. Calcified neurocysticercosis lesions and antiepileptic drug-resistant epilepsy: A surgically remediable syndrome? Epilepsia 2013;54:1815-22. Gupta RK, Kumar R, Chawla S, Pradhan S. Demonstration of scolex within calcified cysticercus cyst: Its possible role in the pathogenesis of perilesional edema. Epilepsia 2002;43:1502-8.